5 People Born in the 1800’s — and Still Alive! There’s been a big deal made this week about the five people still alive who were born in the 1800’s, and rightfully so. As I wash down an A1 Peppercorn Burger from Red Robin and a bag of Cheetos with a Dr Pepper, I’m not even sure I’ll make it to 50, let alone 115. Now add the age you will be this year. The result will be 115 for everyone in the whole world. 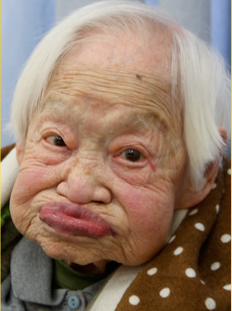 For instance, the oldest living person, Misao Okawa, was born on March 5, 1898. For her, this trick yields 98 + 117 = 215, not 115 as promised. As it turns out, this trick doesn’t work for anyone born after 2000, either. For instance, my sons were born May 2, 2007, and for them, 07 + 8 = 15, not 115. Now, I know what you’re thinking. Surely, something must be wrong. There’s not really an error floating around the internet, right? But it does appear to be the case. The result will be 2015 for everyone in the whole world. Unsatisfying, sure, but at least it’s correct. “Oh, surely there must be more to it than that,” said the reporter. It’s not uncommon for reporters to interview centenarians and ask them about their longevity. Linda Gojak has long been a proponent of doing away with tricks in math class (see also Making Mathematical Connections, October 2013). In a bookstore or library, pick out two identical copies of the same book. Keep one, and give one to your friend. Ask your friend to pick a number, and both of you turn to that page in the book. Then tell your friend to pick a word in the top half of that page, and silently spell that word while moving forward one word for each letter. (For instance, if they picked “math,” they’d move forward four words as they spelled.) Have them do that again with the word they land on; then again; and again; till they reach the end of the page. They should stop at the last word that won’t take them to the next page. Do the same thing with your copy of the book — though make it obvious that you’re not copying them and using the same first word. Miraculously, you and your friend will land on the same word at the end of the page. Ours is not to reason why; just invert, and multiply. Just add a 0 when multiplying by 10. The butterfly method of adding and subtracting fractions. From my perspective, tricks are not inherently bad, as long as students have developed the conceptual understanding necessary to recognize why the trick works. In fact, the standard algorithms for multiplication and long division are, essentially, math tricks. But if students are able to reason their way to an answer — and, even better, if they can discern these tricks on their own from examples — then the ‘tricks’ can be useful in helping them get answers quickly. The problem is that many teachers (or well-meaning parents) introduce tricks before students understand the underlying mathematics, and that can be to the students’ detriment. Instead of mathematics appearing to be a cohesive whole, students believe that it is a large bag of disconnected procedures to be memorized, remembered for the test, and then promptly forgotten. You need to learn the rules of grammar, so you can feel comfortable breaking them. I believe the corollary in mathematics applies here. If you understand the structure and algorithms associated with procedural fluency, then you can then feel comfortable using well-known shortcuts. The Common Core identifies three pillars of rigor — conceptual understanding, procedural fluency, and application — and asserts that each pillar must be “pursued with equal intensity” (CCSSM Publishers’ Criteria for K-8 and High School). But I’ll take that one step further. I contend that conceptual understanding must happen prior to procedural fluency for learning to be effective. That contention is based on research as well as personal experience, and it’s consistent with the NCTM Procedural Fluency in Mathematics Position Statement, in which the Council states, “Procedural fluency builds on a foundation of conceptual understanding, strategic reasoning, and problem solving,” citing the Common Core State Standards for Mathematics, Principles and Standards for School Mathematics, and Principles to Actions: Ensuring Mathematical Success for All. A mathematical trick, as far as I’m concerned, is merely the recognition and application of a pattern. A simple example is the 9× facts. By looking for patterns, students might notice that 9 times a number is equal to 10 times that number minus the number itself; that is, 9n = 10n – n. For instance, 8 × 9 = 80 – 8. This makes sense algebraically, of course, since 10n – n = (10 – 1)n = 9n, but I wouldn’t expect a second grader to be able to work this out symbolically. I might, however, expect a second grader to correctly reason that this should always work. From that, a student would have a way to remember the 9× facts that is based on experience and understanding, not just remembering a rule that was delivered from on high. Take two numbers from 11 to 19 whose product you’d like to know. For example, 14 × 17. Add the larger number to the units digit of the smaller number. Concatenate a 0 to the result. Multiply the units digits of the two numbers. Add the last two steps. And there you have it: 17 × 14 = 238. Why this trick works is rather beautiful. The steps requiring students to add the larger number to the units digit of the smaller number and then concatenate a 0 to the result are represented in bold above as 10 × (17 + 4). Those steps in the rule are just a shortening of the second, third, and fourth lines in the expansion above. would they be able to generate the above rule on their own? Probably not. But that’s okay. The rule is not the point. The point is that there is an inherent structure and pattern within numbers, and students might notice some patterns in the factors and products in the four examples above — for instance, the smaller factor decreases from 15 to 14 to 13 to 12 as you progress from one example to the next; the larger factor increases from 16 to 17 to 18 to 19; and the product decreases by 2, then by 4, then by 6. Something’s going on there, but what? Ours is not to tell them why; just give them more examples to try! Today is 11/7/13, which is a semi-lucky/lucky/unlucky date. Multiply your age by 12. Now add the age of your spouse/brother/sister/friend/uncle/aunt/whomever. This should yield a three-digit number. Now, divide by 11. The result should be a number of the form 0.abcdef…, with a 0 and a decimal point in front of a long string of digits. Add the first six digits after the decimal point. Here’s the cool part. I don’t know your age, nor do I know the age of your spouse, brother, sister, friend, uncle, or aunt. But I do know that after you completed those steps, this is your result. Now, how did I know that? Math Major: I’ve found that 67% of Literature majors are stupid. Literature Major: I’m part of the other 13%. I was walking past a mental hospital the other day, and all the patients were shouting, “13… 13… 13… 13.” The fence was very high, so I peeked through a little gap in the planks to see what was going on. Calculate 39 × (your age) × 259. It didn’t. I suspected what the value of 39 × 259 would be, so I predicted the result. But if you don’t know the value of that product, then maybe you’ll be surprised. The trick works well enough if you have a double-digit age. But my friend Ferdinand is 107 years old. His result was 1,080,807, and that just looks like a mess. The results for my six-year-old sons were better, albeit rather unsatisfying. Ha-rumph. So much for the Internet providing mathematical inspiration. Calculate 7,373 × (your age) × 137. Calculate 9,091 × (your age) × 11,111. Calculate 101 × (your age) × 1,000,100,010,001. To create more puzzles like this, enter factor(101010…10101) into Wolfram Alpha. Calculate 101,101 × (your age) × 9,901. Calculate 3.3 × (your age) × 33.67. Calculate 3 × (your age) × 37. Calculate 41 × (your age) × 271. I’ve been good with numbers my whole life. When I turned 2, I realized that my age had doubled in one year. This concerned me… at that rate, I’d be 32 in four more years! Today is 7/11/13, and boy, have I got a great math trick for today! You’ll likely need a calculator. This should yield a three-digit number. Now, divide by 7. Here’s the cool part. I don’t know your age, nor do I know the age of your spouse, brother, sister, friend, uncle, or aunt. But I do know that after you completed those steps, the result was 27. There are myriad math tricks of this ilk, but this one is my favorite. It’s based on a trick I learned from Art Benjamin, though I think the one above has more panache than his original. Decide for yourself. Choose a number from 1 to 70, and then divide it by 7. If your total is a whole number (that is, no digits after the decimal point), divide the answer by 7 again. Is there a 1 somewhere after the decimal point? I predict that the number after the 1 is 4. Am I right? Now add up the first six digits after the decimal point. 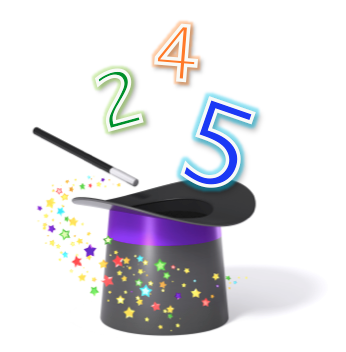 Just as with the trick above, the result will always be 27. Regardless of which trick you prefer, have a happy 7/11! And if you’ve got a few hours to kill, you can try to solve the 7‑11 problem.